Tag Archive | "Briny Breezes"
Katie Schumann met the actor Robert DeNiro during spring break. Photo courtesy of Glenn Stout. 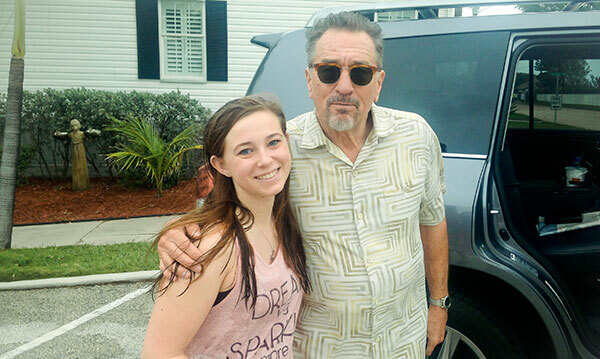 A Cedar Springs grad had an exciting spring break this year when she met Hollywood star Robert DeNiro on the set of a film he was making in Florida. Katie Schumann, the daughter of Mark Schumann, and Jayne Bremmer, all of Cedar Springs, was visiting with her Grandma Verla, Uncle Glenn Stout and Aunt Boni in Briny Breezes, Florida at a mobile home park located on the Atlantic ocean, about fifteen miles south of West Palm Beach. Katie said her aunt told her the night before that they might be shooting the movie the next morning at the clubhouse, where there Zumba class was held. “My Uncle came back from trying to get his DJ equipment up at the clubhouse and he said that the filming crew was up there filming a scene! He got his camera and went running back up there and I was close behind him,” she said. “Katie and I made our way to the clubhouse early on the suspected day to find lots of people shouting directions to local resident extras while camera men shot the scenes from the clubhouse porch. Golf carts and police cars were everywhere,” said Glenn. The two watched the crew film a scene, but didn’t see DeNiro and then they announced it was time to move to a different location. “I had just said to Katie that while this was certainly filming for a movie, it didn’t appear that Mr. DeNiro was there. Lots of unfamiliar faces, but none that looked like him. Katie’s eyes got big when she said, “Look! He’s right over there!” He had walked right by us, inches away, on his way to his car! The next thing I knew, Katie was following him and his assistant. It made me a bit nervous. What was she doing? Glenn saw the actor get out of the car and pose with his arm around Katie, so Glenn whipped out his phone and took the photo. DeNiro then got back in the car and was driven away. Katie said she has one more year at Grand Rapids Community College, and then plans to go to Grand Valley State University.